Brother Bear, Sister Bear, and Cousin Fred are determined to get their Trailblazing Merit Badge. They are carefully following the Bear Scouts guidebook. 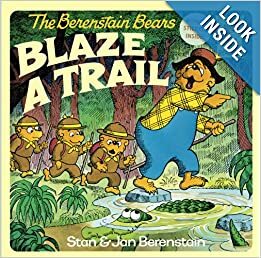 However, Papa Bear has some ideas of his own about the best way to blaze a trail. Through the swamp, the brambles, and Rocky Gorge, Papa forges ahead, getting himself into all kinds of problems. And as usual, the younger bears are able to help him out. That is until Papa Bear decides to make some trailblazer stew. . .